Printing demands and invoices to tenants is a key operation for all property managers. 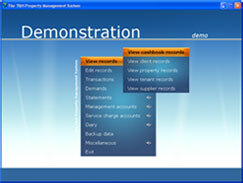 Our system will guide you through this process step by step using the new interface wizard screens. The demands function has been designed with flexibility in mind, allowing you to adapt the system to your preferred way of working. For example, you have the flexibility of generating regular demand runs for recurring charges while still being able to print ad-hoc demands for those occasional one-off amounts. 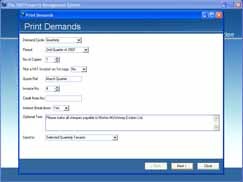 There are also numerous formatting, VAT and display options which allow you to tailor make the way that the demands are printed. Automated features such as interest calculation on late payment and section 166 notices are sure to cut down on the time spent generating demands. In addition to the standard options you will benefit from supplementary options such as the automatic meter reading facility, tenant arrears statements, demand summaries and printout archiving. The system will guide you through every operation step by step. Numerous formatting, VAT and display options. The automatic meter reading facility.